Following are 14 practices for dissolving shadows and experiencing your True Self. It is completely up to you which of these practices you implement in your life. It is also up to you how often you do them and how devoted you are to this process. What I can tell you is that the more you practice these and the more you implement all of them into your life the faster you will experience the results you wish for. Do them exactly as prescribed at first. You can adjust them for your needs and preferences after a few months. With absolute honesty and focused introspection, pay attention to all the feelings in your body and emotions. Very often shadows will express themselves physically – tension, inability to sleep, illness, lack of dexterity, lack of mental clarity. Sometime you will not even realize the shadows are there. Just be honest with yourself. Be vigilant. Feel them, acknowledge them, but do not contend with them. Do not fight them. Just look at them. Watch the shadows without judgment or desire to see them gone. Do your best not to react to them. Do nothing more. When you have watched the shadows for a while something marvelous will happen. You will begin to disassociate from them. You will identify yourself as the one who is watching and not as the darkness. The one watching is not suffering. Relax into the peaceful, non-judging watcher. You will come to realize that the shadow is not really a part of who you are. It is more like something dark that enters you. Maybe it even attempts to overwhelm you, but is not who you really are. Just watch and feel yourSelf. Morning and evening seem to be the best times for this practice. There will probably be a hundred excuses for not doing these meditations but only one, very important reason, for doing them. Your life depends on it. The second step in this process is to allow yourself to feel the Spirit that you are, the Real Self, the One who knows no pain, suffering, anger or any other shadow. As you look honestly at what you are not, (the shadow), and disassociate yourself from it, you will begin to experience the Real Self, the Spirit that you are. Then look back at the shadow and say to it with clarity and certainty; See, this is what I am, not you. Feel that sense of Self-Realization. When you feel your Real Self, the Soul, even if it just a glimmer at the beginning, take a deep breath and as you release the breath, relax into It, melt into It, dissolve into It as if nothing else matters at that moment. Imagine that your body and mind are completely dissolving into the Peace, Love, Joy or Bliss. Let go of any agendas or control. Just melt into Infinite Love. Take another deep breath and feel your Spirit. Then watch and feel the shadow dissolve. The Soul will feel peaceful, free, loving, joyous and fulfilled. Feeling your Soul after dissolving a shadow is like a sigh of relief. If you notice any shadows still present, dissolve into your Spirit even more. Be honest with yourself, be sure the shadow is dissolved and is not just sublimated. Feel and be your Soul and the shadow will be dissolved. The third step in the process is the most essential. After you have gained this wonderful Self-awareness, you must then live the truth of your Soul openly and honestly in your life. This third practice is the one that keeps the shadows from returning. It allows you to tangibly experience all that you really are and all you are meant to do in this life. Living your Soul reveals the fulfillment, love, joy, flow, grace and peace that you always dreamed were possible. If you notice the shadows returning ask yourself; Where in my life am I not being true to my Self? When you have the answer, make the changes necessary. Continue this process until the shadow is dissolved and you really feel the truth that was hidden by the lie. Sometimes you may have to do this process many times before you see a real difference in your life and feel a real difference in yourself. Sometimes it only takes minutes or hours to see a tangible difference, though more often it takes longer. But the truth eventually does shine through. The shadows must and will disappear. Stay with these practices no matter what. Do not argue, fight or conflict in any way with the shadows. If you do it will just make them seem more real. Remember, no matter how real they seem, they are just shadows! This is not a battle, it is an awakening. As I said, the process is quite simple but demands the honest and consistent ‘doing’. The benefits are great for you and your world. Use your terms and images as you develop this process for yourself. The more you feel, the more effective the process is. Try it for yourself and see. Surround yourself, as much as possible, with music that uplifts and reminds you of the Spirit that you are. Music that is peaceful and joyous. If the music has lyrics, be sure they are positive and uplifting. There will be times that you cannot choose what music surrounds you. That is when you will need to pay close attention to how the music is affecting you and use the inner dialogue to dissolve any shadows that come up. As in practice 4, read books and other materials that remind you of the wonderful, loving, joyous Spirit that you are and of the goodness that God is. There are thousands of books available like this; fiction and non-fiction. Find those that ‘speak’ to your Spirit and uplift you. Keep them handy. There is no way to be rid of suffering and to consume alcohol or drugs. Even one drink invites darkness into your life. This is a choice only you can make – peace, joy, fulfillment, love… or alcohol. You can have one or the other but you cannot have both. If you are taking a prescription medication ask your physician if a possible side effect of that medication may be depression, anxiety, pain, etc. If it is, discuss with your physician possible alternatives. Once you are experiencing yourSelf, peace and fulfillment on a consistent basis then you can re-examine your intake of alcohol or drugs. If you choose to try them again the do so very slowly and see what your reactions are. The choice is yours. Surround yourself with art, objects, colors and even scents that uplift you. Create an environment that is a constant reminder and mirror of your beautiful Soul. Put away, sell or give away anything that reinforces the shadows. Clean out your home the way you are cleaning out your personality. Every time you turn around and everywhere you go in your home there should be something there that reminds you of who and what you really are and how beautiful the world really is. You are a beautiful Spirit expressed as a human being, an expression of Infinite Divine Love. How do you deserve to be treated? With respect, caring, compassion, love and gentleness – that is how you deserve to be treated and how you should treat all others. For are they not Spirits as you are? There are times when you cannot choose who you are with, but never should you accept treatment that causes you to feel less than the pristine Soul that you are. Nor should you ever act towards or treat others as less than what they are. There is something quite magical that occurs when you live this practice. Those who insist on treating you badly should be kept at a distance and dealt with only when necessary. If there is a person in your family or at work treating you poorly it is essential to let that person know that unkind behavior is no longer acceptable. Shadows will hold on to you as long as you accept treatment that tells you that you are less than who you really are, or as long as you treat others as less than who they are. Look and listen honestly inside yourself. Is there any voice or feeling telling you that you are undeserving or unworthy? Look into a mirror, say to yourself, I love you. Listen and feel what the internal reaction is to what you have just said. Is there anything inside that disagrees with you in any way? Is there anything inside that tells you that you do not deserve to be loved? Is there anything inside treating you as less than who you are? These feelings are not you. They are shadows you have carried with you, maybe all your life. Dissolve any shadows that tell you that you are undeserving or unworthy. Darkness cannot hold on to you if you truly love yourself and feel deserving and worth of God’s goodness. To do this exercise all you need to do is contemplate Infinite Love. Love without beginning and without end. Love without limits or boundaries. Love that is not dependent on any situation, person, place or thing. Love that is always present no matter what. (You can replace the word Love with Joy or Peace with the same powerful effect). Feel and contemplate this in the very present moment. Let go of the past or the future. Pay attention to just this moment, wherever you are. Imagine yourself surrounded by this Love. Imagine it filling your body and then your mind. Then feel yourself melt into it, dissolve in it as if all the atoms and molecules of your body were dissolving into everything around you. Like a drop of water dissolving into the ocean. Dissolve into God as if nothing else mattered at the moment. Rest in that state for a few minutes. Feel Love and feel loved. Feel whatever there is to feel there at that moment. Judge nothing. Let go completely of any concerns about how anything you are dealing with is going to turn out. Watch thoughts float by but do not struggle with them or become attached to them. For these few moments nothing but Infinite Love, Peace of Joy matters. In Infinite Love there is no depression pain or fear. There is no darkness of any sort. This infinite Love is everywhere and everything. It is always with you, closer than breathing. Ultimately this Infinite Love is all that is Real. It is God. It is your source and your home. If you do this practice at least three times a day it will change your life. You will be amazed with the results. An important note about this practice. At some juncture when you are doing this practice you will come to a point when you are faced with an important choice. When you dissolve into Infinity enough you will get to a point when you feel that you will die if you go any further. You will feel as though there will be nothing left of you and that you will cease to exist. Everyone reaches this cliff. The choice will always seem to be yours. Only you can make this choice. This will not be an intellectual exercise. You will really feel as though you are going to die right then and there. It is often said that you must be willing to die to experience Enlightenment. It is true. I will not tell you what will happen. You must experience this for yourself not knowing what will happen and not caring what will happen. If darkness is your shadow reminding you of the Soul that you are by being what you are not, then living your Soul leaves the darkness with no purpose or place in your life. Therefore it cannot exist. Being yourSelf, being authentic, is the essential ingredient in keeping the shadows from coming back after you have dissolved them. This is a lifetime discipline. Take quiet time each day to listen to your Spirit’s voice. The Soul’s voice is very subtle and quiet, so you must be still and listen carefully. Do your best to live what your Spirit wants to live, say what your Soul wants to say, feel what your Soul wants to feel and think what your Spirit wants to contemplate. Be open, honest, and compassionate. 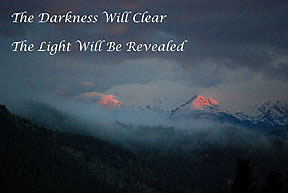 Remember there will be no darkness in your Soul or its guidance. Dissolve, with the inner dialogue or meditation, any feelings or thoughts that do not feel like an expression of your pristine, loving Spirit. This can be a lot of work at the beginning but it does get much easier the more you practice it. Being your Soul should give you a feeling of peace, joy, freedom, comfort and fulfillment. You cannot be any more wonderful that being your Soul. When you are being yourSelf, darkness cannot exist in your life. If you did not eat food or take in any nourishment for an extended time your body’s systems would eventually become depressed and then cease to function. In the same way, if your emotional and spiritual needs are not met your emotional self becomes depressed and eventually ceases to function. You may be able to go longer without your emotional needs being met than without food or water, but in the end, the results will be the same. When you emotional systems have become depressed it is very difficult to even know what your needs are. Here is an exercise that will help. Sit quietly in a quiet comfortable place and have paper and pencil within reach. Close your eyes for a few moments and take some deep breaths. Relax as much as you can. Now, with eyes closed, contemplate things that you have done in your life that felt wonderful, fulfilling, joyous and or nurturing. Also contemplate things that you feel would be fulfilling, joyous and or nurturing that you may not have experienced yet. Then open your eyes and write on the paper what you have experienced in your contemplation. These are heartfelt needs. Things your Spirit wishes to experience. This is the beginning of your needs list. Now continue to write needs you have in your life, whether they are being met or not; even if they are outside the parameters of what is possible at the moment. Keep in mind that heartfelt needs do not bring harm to another nor do they infringe on anyone else. Just be honest with yourSelf. As you write these needs down listen for anything inside you telling you that you are unworthy or undeserving of having any of these needs met. Take a moment to dissolve that shadow. When you have completed this list look at all the needs you have written down. On the left side of the most important ones make an asterisk. Then go down the list and on the right side make a check mark next to each need that is already being met. If there are needs that have an asterisk but no check mark it is very important that you sit quietly and contemplate why those needs are not being met and how they can be. communication and understanding are present constantly. Important heartfelt needs not being met in a relationship open the door to shadows and can also create other difficulties in the relationship. For every beautiful scene that you see, for every flower that graces your path, for every insight, for every glimmer of joy, peace or love, for every respite from anger, for every caring word, for every gift you receive….. Thank God, Infinite Love, your guides, other people or whomever you feel inspired to thank. Do express your appreciation in as many ways as you can imagine. At the end of the day, express your thankfulness before going to sleep. During the day, as often as you can remember, express your appreciation for the Joy and Love that you are and that fills you. This is an incredibly magical practice. Try it and see how it affects every aspect of your life in wonderful ways. So, these are the 14 practices for dissolving shadows and experiencing a fulfilling life. Some of these you may already be living, some you may have tried for a time. Some of these practices may seem difficult to you for one reason of another. It is essential that you live all 14 of these practices consistently as if there were nothing more important in the universe. And in truth, right now, there is nothing more important than dissolving these shadows in your life and feeling the joy of your Soul again. Know that you are already a pure and perfect, joyous and loving Soul. The shadows may be distracting you from your authentic Self right now, but they cannot do so much longer once you begin working with and living these 14 practices. Do not accept this darkness as an inevitable part of your life, for it is not. Suffering is not an inescapable pit. You can get out of it. You can dissolve it. not occur overnight. It takes consistent practice, persistence and devotion to dissolve those deep and stubborn shadows. During the second 120 day period continue to read the 14 practices at least twice a week so that you are reminded of the 14 practices lest you get distracted. Remember that the 14 practices to dissolving suffering are also the 14 practices to a totally fulfilling life. They are a lifetime discipline and lifestyle that become easier with time. Let the 14 practices become a part of you and your day to day life. As your life becomes more joyous and fulfilling, share these practices with everyone who comes into your life asking you how you can be so peaceful, joyous and loving. Share with them the reasons that your life seems to flow so beautifully.